Horsemart exists, but I’ve not looked at it recently – instead I’m doing the rounds of donkey dealers and beach donkey racqueteers, meeting friendly people who love to talk about donkeys with me while working out my motives and whether I’ll be good to their beasts, while I soak in their knowledge and advice at the same time as working out their motives – are they more interested in money than fixing me up with the right creature? It’s a multi-layered conversation and, like having all your apps open at once it’s run my batteries down in double time. I’m bushed, my phone is dead, and I’m on the train out of Wales after a speed donkey-seeking visit which was just almost extended in a state of chaotic multiple-option cross-planning with a tight deadline of a departing train, three different men with donkeys, a phone with three different donkey-man websites, train timetables, texts and calls and down to 1% juice, both parents and their vehicles, two trips to Machynlleth station, a cup of tea and a jar of homemade gooseberry jam. This, as yet, is not a zen experience of walking-speed landscapes and gentle creatures – it’s all me-me-me-and-my-vision! I’m demanding and on edge. I didn’t stay on. I’ll go home and consider what today’s donkey leads led to. Could it be a Borth donkey? I met the hard-as-nails Borth donkeys who live by the train line. Borth is a seaside village which is almost always cold. Today it was the bitterest ever – the sort of wind that ravages your exposed fingers until they feel like bare bones that can’t turn the camera off or direct themselves into your pockets. The ear flaps on my hat beat me around the cheeks and the donkey-man Bill’s bread bag broke free and whipped off into the distance only to whip back later from another direction. A raven struggled to take off, its feathers fanned against the gusts like the silhouette of skeleton fingers scrabbling at the wind as it leaped six feet up and then landed messily and unintentionally again. The donkeys’ drinking trough bathtub was frozen over, broken and refrozen again. The donkeys didn’t blink an eye, but ran over and surrounded Bill, my mum and me, and went for the bread. They’re all big animals, but not frightening – calm and friendly and shaggy. Daisy, Bill’s top pick for me, shied away a bit, and was a patchwork of cream and grey splotches, including spooky eye patches, like a skeleton’s sockets. Two brown ones came right in to say hi. 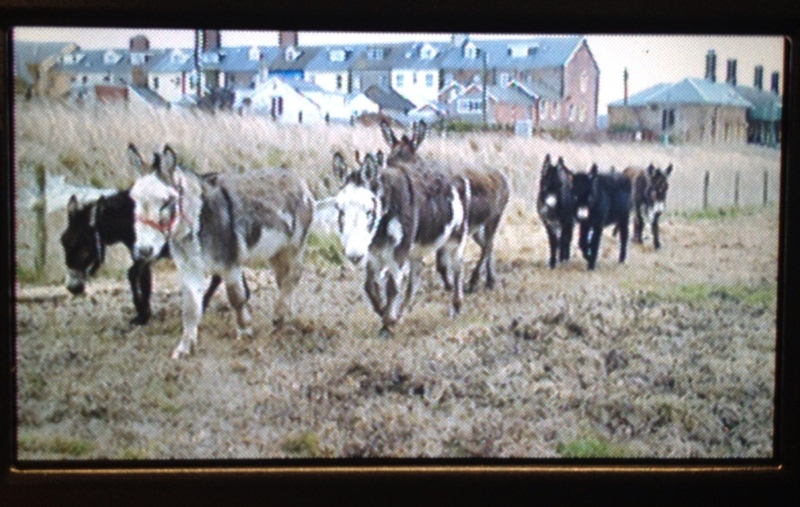 I’d dearly love to take a Borth donkey – they’re donkeys from my patch. Mum and Dad lived in Borth when they were first married, while they were on honeymoon the sea flooded their rented house and drowned the pile of wedding presents and belongings they’d not yet unpacked. I was brought up with a very wrinkled dictionary that survived – an antediluvian tome! I swam in the sea with aunts and uncles and made mazes on the beach. Not so long ago I visited friends who’d spent the day diving for spider crabs, and we sat around the fire in the garden throwing them one-by-one into the boiling cauldron made out of a gas bottle. A little further down the road I leaned to drive on the beach, took visitors for walks on the boardwalks through the dunes, and learned about marram grass in the visitors’ centre portacabin with sand on the floor and and a dampish sticky saltiness everywhere. So, Borth means a lot to me and I’d love to take one of its children on this adventure. I need to go back on a kinder day and take each of the shortlisted three, who Bill says will ‘walk on’, for an hour or so’s walk, and commission the local donkey welfare officer to pay them a visit too. They seemed to me to have the energy, but it’ll be necessary to have any donkey looked over – hooves, general health, willingness to leave the others, fitness etc. But I’m cautiously optimistic. They’re not coddled, much rougher than many, but they do the beach run, and so they’re used to kids, and carrying. Two donkeys seems like a good idea, but tricky, logistically. Suddenly the gentle progress of donkey and woman is complicated by horseboxes, rendezvous points and donkey switcheroos. The point though would be to give each donkey a proper rest every couple of weeks, have a backup in case of lameness, pack strap rubbing, illness etc. I’d be able to do fewer rest days and make more headway. 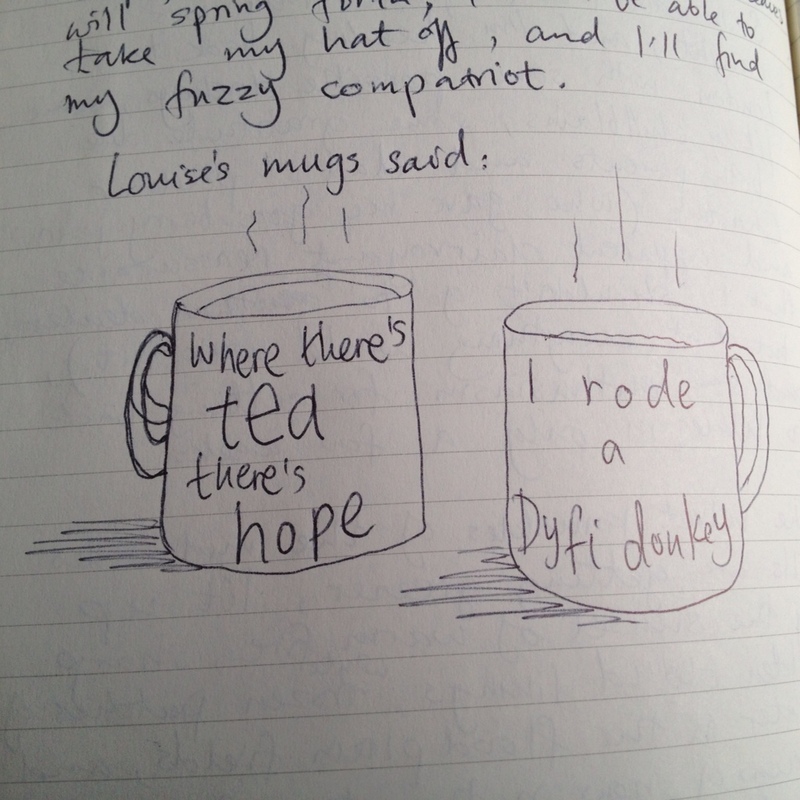 Without a pen of donkeys to calm me down, I accidentally went into overdrive and almost raced around Wales looking at more donkeys in more parts of Wales. But instead I’m on the train out of here, having to believe that all will come right, and pinning all of my hopes on the shaggy beasts of Borth. Out of the window the velvet knuckles of the Mid Wales hills are getting greener, lit up by the sunset of warm fire, sharp golden cloud linings, frozen white puddles in the flood plain fields and grains of snow in the ruts of the farm tracks. Cold lambs and cold daffodils and cold people wonder when spring might get on with it. Last Wednesday Aberystwyth was on the news as the warmest place in the country at 17ºc, better than the town’s last news appearance for putting horses in beef products. Four weeks until I start camping, and I don’t feel hardy, and the countryside doesn’t feel welcoming. It takes faith to believe that the sun will stop just looking warm, and the leaves will spring forth, I will be able to take my hat off, and I’ll find my fuzzy compatriot. take your Time!!!!! Do it for the donkey, you need to be very good friends before!!!!!! Don.t buy now a donkey and go this year for 1000 miles. I buyed my donkey in 2009 and walked in 2012 1600 km from the netherlands to france with donkey Frits. I practice with walking three years, you need to do that, to become not too much problems. It’s a pitty you cannot read my blog, try to translate!!!! Hi Margo! Thanks for getting in touch – you’ve really done this adventure! I have a million questions for you, and I will make full use of Google Translate on your blog! I am going to go this year, but I am definitely going to take my time. It’s all going to be at the donkey’s pace, and when we need to rest, even for weeks, we will. I am going to spend many hours with the donkey every day between now and departure, and departure will only be when he is ready. 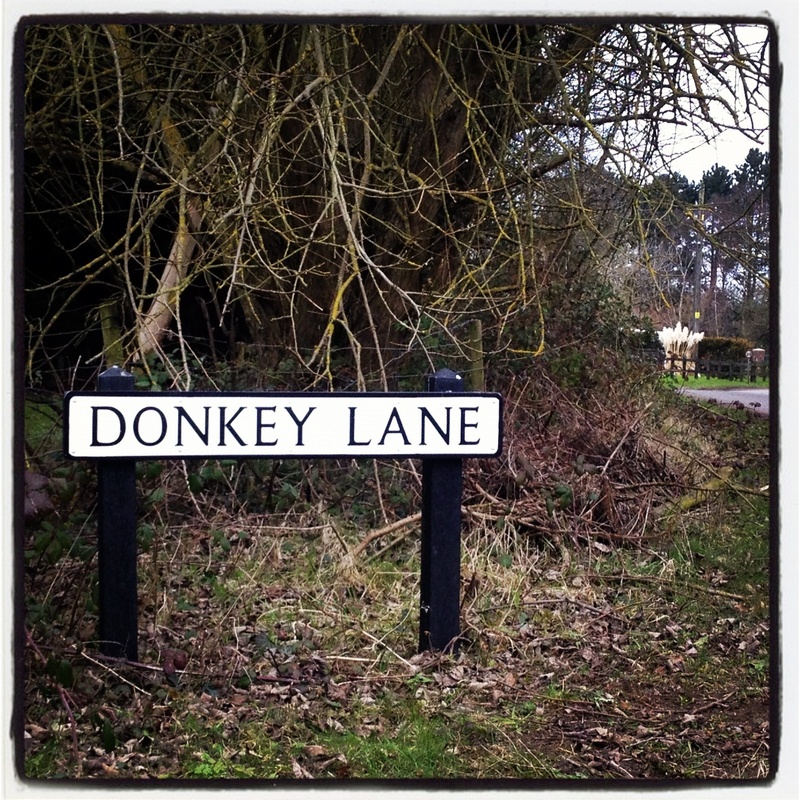 Since I read Robert Louis Stevenson’s Journey with a Donkey a couple of years ago I have wanted to retrace his steps. Of course a donkey would be an imerative part of this but when I’d finished I’d want to bring the donkey home. Before I can go I need to do more research – I rode horses years ago but know very little about donkeys so I need to find out more about their care. 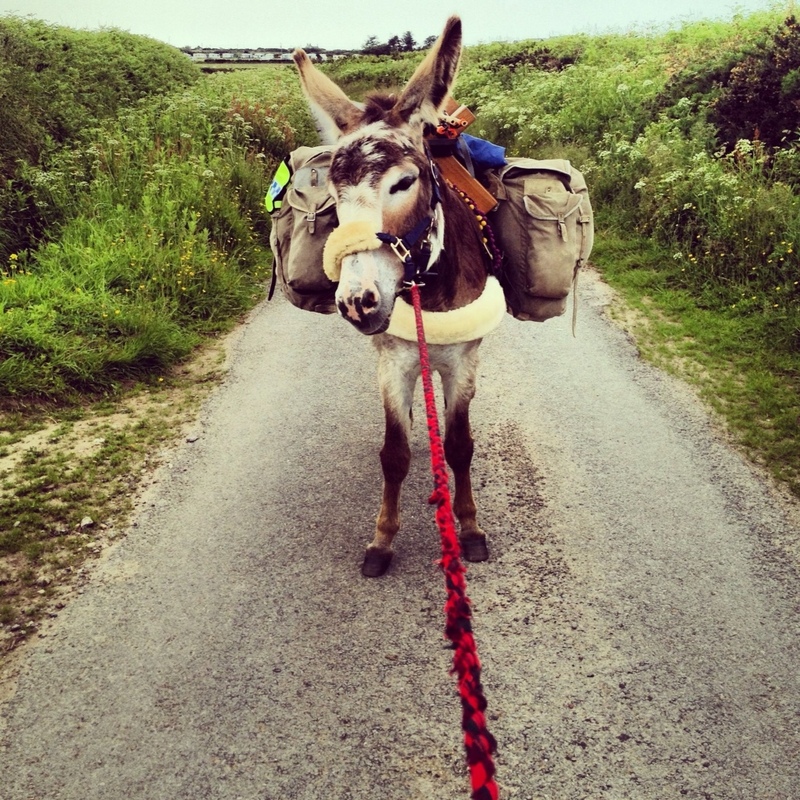 Like RLS I would like the donkey to carry a pack – tent and other camping equipment, food, clothes etc. so I need to find out about fitting packs. I also need to find out about purchasing a donkey in France and then transport back to the UK. I’m told (although I’ve not looked into it) that donkey walking has become quite a thing in the Cervennes, thanks to good old RLS, and you can hire a donkey who is used to walking, and all its necessary pieces of pack etc. I’d recommend this heartily! RLS’s route took him 12 days, and so it’s a shortish journey for which to spend a lot of time training a donkey and buying your own kit. There’s also a book called Wisdom of Donkeys by Andy Merryfield, who walks through France using a donkey-walking company. But if you do want to buy your own donkey and kit and all I’ll be happy to advise where I can – I’ll email you this comment too so we can be in touch. It was all fine in the end, but oh man, I suffered the terror of irresponsibility at this point. It seems so obvious in retrospect – exercise is good for everyone!